I'm just bopping by with a little project idea for you. It's a little something that I made for my hostess this past Saturday! (Hi Janis!) What I love about it is that it's very simple to create but is lovely in it's simplicity. I started with two lightweight 4 x 4 blank coasters and using my Anywhere Glue Stick covered them with pieces of Bella Rose Designer Series Paper front and back. To smooth out the edges and get rid of the excess paper, I sanded them down with my Sanding Block. To create the inside accordion fold pages, I cut two pieces of Bella Rose paper at 3" x 12" then scored them at 3" intervals. I then overlapped two of the ends and adhered them together with SNAIL adhesive. 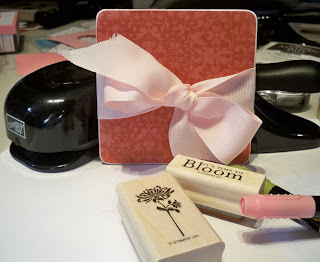 The cardstock photo mats and journaling blocks are cut at 2 3/4" square and are adhered with SNAIL as well. I used Chocolate Chip and Whisper White cardstock. 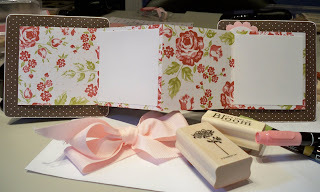 To add a little zip to the inside, I took out my Bella's Bloom stamp set and markers - Regal Rose and Old Olive. Coloring directly on the stamps with the markers, I then stamped the images onto my cardstock. It's a little hard to see, but I used Old Olive on the "It's Time to" and Regal Rose on "Bloom" to give added punch to the sentiment. The flower image was punched out with my 1 3/8" Circle punch and was layered on a piece of Pretty in Pink cardstock punched out with the Scallop Circle punch. This was then adhered with SNAIL as well. The ribbon belly band was created with a piece Pink Pirouette Wide Grosgrain Ribbon. I was so happy with how this project came out and Janis loved it too. Let me know what you think and be sure to let me know if you create one yourself. It's super easy and makes a great little gift for someone! So pretty!!!! Your hostess must've flipped when she saw it!!! Great project and wonderful directions. This looks fun to make.